This Sunday at Graystone Church we as kick off a brand new message series, Road Trip. We will spend the next 10 weeks studying through the book of James. Please make it a priority to be at Graystone this Sunday, because I will be sharing some important background info on the book of James. Also, we will pass out the new daily Bible Reading Plans that we will all study together over the next 10 weeks and discuss on Sundays at Graystone. 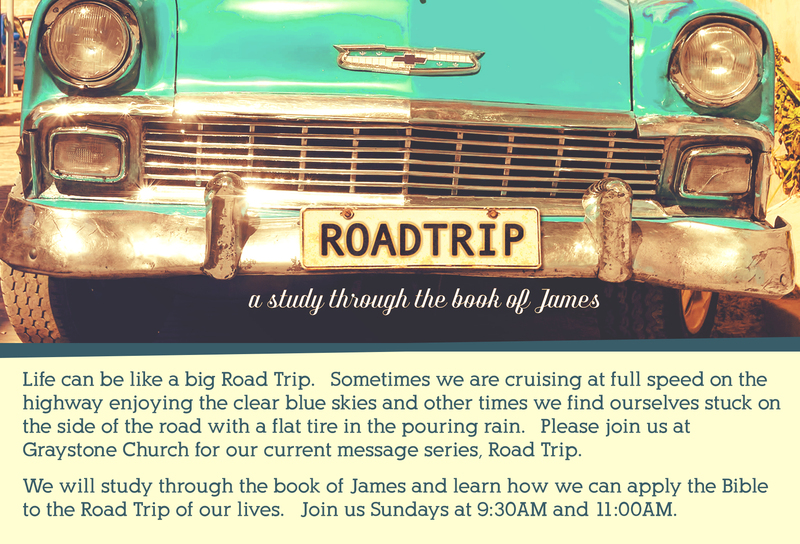 BTW, our Graystone Kids and Graystone Students will also learn from the book of James and will follow the Road Trip message series geared for their ages. It will be a great spiritual growth opportunity for the entire family. I am encouraging our families to read the short passage together each day at dinner or before bed. Hope your family can make it on Sunday!